When you register for certain parts of our Website, we will collect certain personal information, such as your name, address, company or entity name, and email address. When you make a donation on NJY Camps, we will collect information such as your name, company or entity name, email address, and check/credit card information (collectively, “Registration Information”). We may retain any information volunteered by you, such as survey information or Registration Information. If your personal information changes and you wish to update it, or you wish us to delete your information, you can make changes and requests for deletion by sending an email to us at the following address: support@njycamps.org. Additionally, NJY Camps may collect site use information, such as what pages site users access and visit, or what browsers site users utilize to access the Website, on an anonymous and aggregate basis as you and others browse our Website. This information is used to give us a better understanding of how the Website is being used by the users and to provide better service to users. Whenever NJY Camps collects personally identifiable about you, it reserves the right to use that information for marketing NJY Camps and its various activities. NJY Camps may use the personally identifiable data collected to undertake a variety of marketing activities including, but not limited to, email, direct mail, site personalization, telephone marketing and other digital and traditional methods of advertising and communication. NJY Camps does not sell or “monetize” data to 3rd parties. NJY Camps, however, may occasionally partner with corresponding agencies for joint marketing opportunities. It will do so without permanently giving any of your personally identifiable information to those sponsors and partners for their own use. Registration Information. You will provide us with certain information about yourself, your family, and/or your credit card information when you register on certain parts of the Website, or register to become a donor. Site Use Information. Similar to other commercial websites, NJY Camps utilizes a standard technology called “cookies” (see explanation below, “What Are Cookies?”) and server logs to collect information about how our Web site is used. Information gathered through cookies and server logs may include the date and time of visits, the pages viewed, time spent at our Website, and the websites visited just before and just after NJY Camps. We, and ad serving companies, may also use small technology or pieces of code to determine which advertisements and promotions users have seen and how users responded to them. How Do We Use the Information That You Provide to Us? Broadly speaking, we use personal information for purposes of administering and expanding our business activities, improving the content and quality of our services and the Website, and making available other products and services. Occasionally, we may also use the information we collect to notify you about important changes to our Website, new services and special offers we think you will find valuable. You may notify us at any time if you do not wish to receive these offers by emailing us at support@njycamps.org. We may also use your information for billing, identification, and/or authentication purposes. Disclosure of Personal Information. We may disclose your personal information if required: (a) by law or subpoena or if we believe that such action is necessary to comply with the law or legal process served on us or affiliated parties; (b) to protect and defend our rights and property, our site, the users of our site, and/or our affiliated parties, against any threat, whether it be to physical safety or property; (c) to take action against suspected fraud or illegal activities, regardless of whether we or our affiliated parties have been served with any legal process; or (d) to take action to prevent or respond to any violation of our Terms of Service. Sharing Information with Third Parties. We may enter into alliances, partnerships or other business arrangements with third parties who may be given access to personal information including your name, address, telephone number and email for the purpose of providing you information regarding products and services that you have explicitly requested. In connection with alliances, partnerships or arrangements, we may also provide certain information to third parties if we have determined that the information will be used in a responsible manner by a responsible third party. We also use third parties to facilitate our business, including, but not limited to, sending email and processing credit card payments. In connection with these offerings and business operations, our partners and other third parties may have access to your personal information for use in connection with business activities. Notwithstanding the foregoing, the information we collect will never be shared or sold to other organizations for commercial purposes except to provide products or services you requested or unless we have your permission to share such information. We use analytics tools and other third party technologies, such as Google Analytics, Google Analytics Demographics and Interest Reporting, DoubleClick Platform integration cookie to collect non-personal information in the form of various usage and user metrics when you use our online web. These tools and technologies collect and analyze certain types of information, including cookies, IP addresses, device and software identifiers, referring and exit URLs, onsite behavior and usage information, feature use metrics and statistics, usage and purchase history, MAC Address, mobile unique device ID, and other similar information. The third party analytics companies who collect information on our websites and other online products and/or services may combine the information collected with other information they have independently collected from other websites and/or other online or mobile products and services relating to your activities across their network of websites as well as online and/or mobile products and services. Many of these companies collect and use information under their own privacy policies.You may opt out of the DoubleClick platform integration by visiting the Google advertising opt-out page or you may opt out of Google Analytics by visiting the Google Analytics opt-out page. Site Postings. Our Website offers publicly accessible postings. You should be aware that any information you provide in these areas becomes public information and may be read, collected, and used by others who access them. We recommend that you do not post your email address or other personal information in these postings because this information is publicly available for anyone to see and unscrupulous third parties may use this information to form ‘spam’ lists or may otherwise misuse this information. We are not responsible for the use or misuse of information posted by you in public postings by other users of the Website. Notice of New Services and Changes. Occasionally, we may also use the information we collect to notify you about important changes to our Website, new services and special offers we think you will find valuable. As our customer, you will be given the opportunity to notify us of your desire not to receive these offers by sending us an email request at support@njycamps.org. How Do We Protect Your Information? The security of your personal information is important to us. We follow generally accepted industry standards to protect the personal information submitted to us, both during transmission and once we receive it. NJY Camps uses third party vendors and hosting partners to provide the necessary hardware, software, networking, storage, and related technology required to run the Website. Please be aware that no method of transmission over the Internet, or method of electronic storage, is 100% secure, however. Therefore, we cannot guarantee its absolute security. 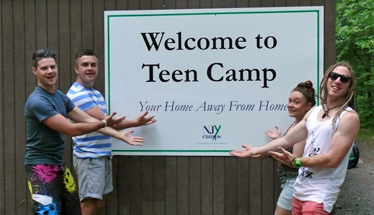 If you have any questions about security on our Website, you can contact us at support@njycamps.org. How Can You Access and Correct Your Information? You may request access or make corrections to all your personally identifiable information that we collect online and maintain in our database by emailing support@njycamps.org. Updating/Accessing/Amending/Correcting Personally Identifiable Information. If your personally identifiable information changes, or if you no longer desire us to have your information, you may correct, update, amend, or request that we delete/remove by emailing us at support@njycamps.org or by contacting us by postal mail at the address listed below. Children’s Privacy. If you are under the age of 13, we ask that you only access our site when accompanied by your parent or guardian. The Website is not intended for, or directed to, persons less than 13 years of age. 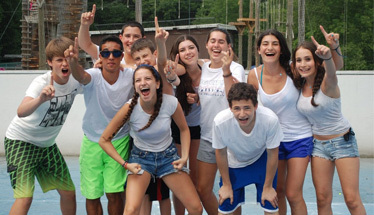 NJY Camps will not request any information from a person younger than age 13, in compliance with the Children’s Online Privacy Protection Act of 1998 (COPPA) and will not knowingly accept personal information from a child younger than age 13 for any purpose. Submissions. Suggestions, materials or other intellectual property sent or transmitted to us via our Website are governed by the separate terms applicable to such materials identified at the time of submission (if any). All such items shall be deemed to be non-confidential, and we shall have no obligation of any kind with respect to such items and shall be free to use and distribute them to others without limitation, including, but not limited to developing and marketing products incorporating them. We believe in providing an experience that is relevant for high school teens and nurtures them at this incredible stage of their development. Teen Camp provides an opportunity for teenagers to learn about themselves, make a difference to the lives of others and realize their leadership potential. Our enriched program features over 75 choice electives, teen travel experiences, service learning volunteering and leadership training and certifications.